Located just a 2 minutes walk away from Aljunied MRT, The Ranch, as its name speaks for itself, feels less like a restaurant and more like a home. 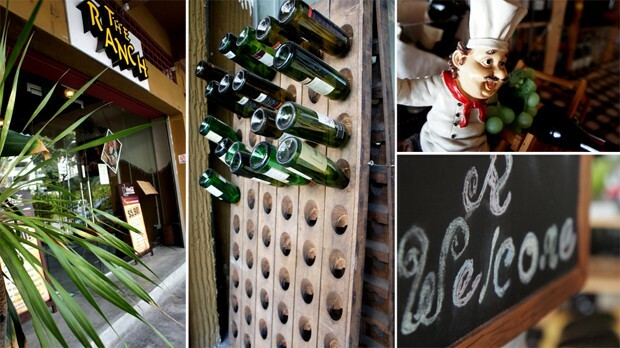 It houses wood furnitures, a wine bar and small wine cellar that offers hard to find bottles from different regions of the world, including Argentina, France and Australia. Everyday, expatriates and residents living nearby flock The Ranch for their affordable and quality food and drinks. Starting off, we had the Chef’s Salad ($8.90) tossed with plenty of fresh greens, cherry tomatoes, cucumber, a hard boiled egg, thick ham and beef ­– all thinly sliced for easy eating. Complete with cheese sprinkles and finished with sweet salad dressing, the generous but light hearted salad is great to get your appetite going. A warm and friendly staff then served us their signature entree, Smoked Duck ($12.00). The lean duck breast meat comes in thick, fleshy slices that were fresh, tender and juicy. We also had Cheesy Chicken Meatballs (6.90) which are richly stuffed with nacho cheese – a starter perfect for the young ones. 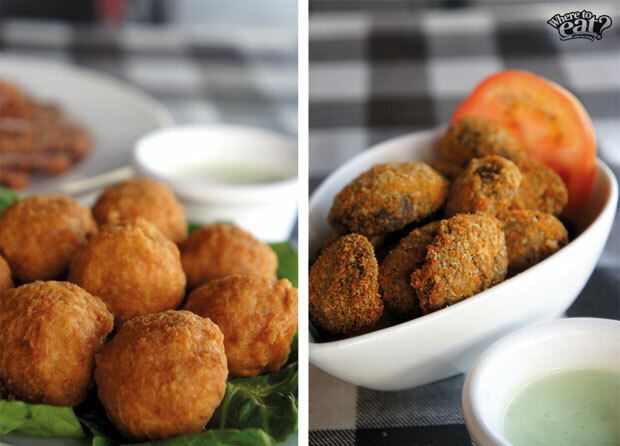 However, if you prefer something fried, we reckon you will find delight in their Fried Mushrooms ($4.90), which are breaded shitake mushrooms deep fried to crisp, but still juicy on the inside. Paired along with homemade wasabi mayonnaise sauce, this dish was most thoroughly enjoyed. One of their mains I found very enjoyable was The Ranch King ($10.90), which has a thick, cheesy beef patty sandwiched between two pieces of gourmet bread that had a soft crust and moist centre. Served with salted truffle fries and fresh greens, I am pretty sure the guys would relish this. Furthermore, as we cannot deny how burgers and wings work well together, we recommend you try their Chick-Me-Up ($6.50) chicken wings. They are evenly seasoned with spices and deep fried till golden brown, achieving a unique taste that is not quite found elsewhere. Taking a bite down on the medium done Tenderloin Steak (Tue–Sun $29.90 / Mon Dine-in Promo $20), seasoned with mixed herbs and grilled till rosy pink, was just as satisfying. More brilliant was the Black Pepper Sauce that came on the side – it packed a punch of spice that was so good. We also had their more popular specialty, Ranch Chicken Chop ($8.90) with delicious homemade Mushroom Sauce that was thick yet not gooey. 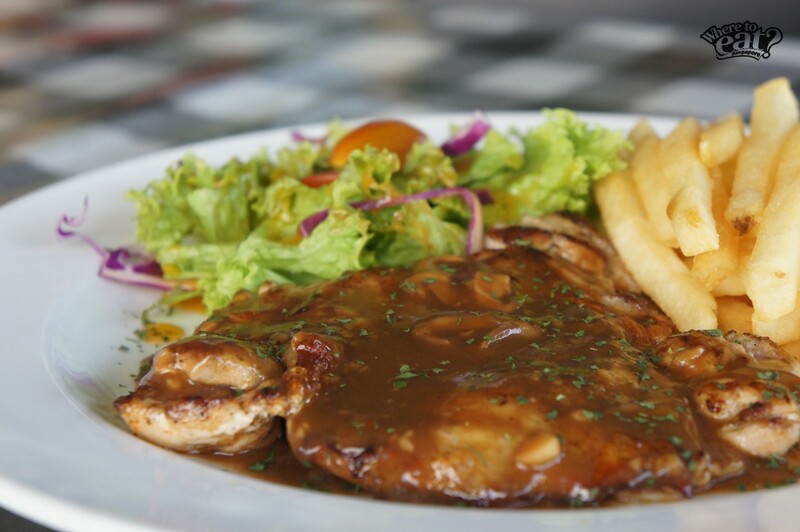 A choice of Ranch Chicken Chop with Black Pepper Sauce is also available for that added punch. For our side dishes, we had mixed lettuce with cherry tomatoes and truffle fries which were fresh and divine. All main courses come with two side dishes from a selection of five side dishes, that include baked beans, mashed potato, mixed lettuce, truffle fries and coleslaw. There was also Aglio Olio ($8.90) with Chicken Sausage (Add $3) and mushroom. I understand how this dish tends to turn out oily but The Ranch’s Aglio Olio was cooked with just the right amount of olive oil – making one feel less unhealthy when eating it. A favourite among my companions was their Carbonara ($12.90) which had just the right amount of cream tossed with crispy bacon and a generous measure of parmesan cheese. We finally wrapped up the meal with a delightfully refreshing glass of Brothers Strawberry Cider ($12.50) that was bright and sweet smelling with light, fresh strawberry notes. Because you are expected to feel home, The Ranch makes it affordable for all to enjoy quality homemade food during lunch hours. Their Weekday Set Lunch ($5.90) gives you a choice of pasta and free Lime Juice, while Lunch Set A ($7.90) includes a soup of the day and choice of main course with the option to top up $1 for a drink. Not to mention, all prices are nett that means no GST or service charge is levied. There is absolutely no reason for you not to visit The Ranch with some colleagues and friends, whether day or night, to kick back, relax and enjoy quality food and wine.